The Royals, though they would record 9 K’s against Strasburg, managed to put their hits together on several occasions to threaten. In the 2nd, 3rd and 4th, the Nats would escape, on fly balls and on strikeouts, but the fifth brought an end to it. David DeJesus (who went 2-3 against Strasburg) battled for a single on a seven pitch at bat, and Billy Butler would follow with another single, putting runners on the corners with two outs. Strasburg would go 0-2 on former National Jose Guillen before giving up an RBI single, on a slider that was to be off the plate, but ended up staying just enough in for Guillen to take it for a ride. After the game, Strasburg played down the effects of the day, giving credit to the Royals for their good day. Strasburg is anxious to put down the hype meter that’s constantly running near him, and that was apparent this evening after the game. He was quick to deflect any of those question, and to return to talking about what he loves: baseball, and playing it. I can’t say that I blame him, given the amount of attention. The Nats struggled today significantly, both at the plate, and on the basepaths. More than once they failed to execute basic baseball, with Willingham botched a slide into second pretty spectacularly, and Roger Bernadina out and out falling down while turning the corner at first. The worst of it came in the fifth and sixth. Willingham lead off the fifth with a full count walk off Bannister, and stole second, but made a terrible slide, and couldn’t capitalize on a ball that went into center. Pudge Rodriguez sent him on to third with a single. Runners at the corners, nobody out, this is where you’re supposed to play big baseball. Adam Kennedy instead bunted poorly, but at least Pudge could get to second. Desmond would strike out on six pitches, as Willie Harris (0-19 since June 3) would stand in the on-deck circle to take Strasburg’s place. With Desmond’s strikeout, Jim Riggleman decided that Strasburg could go ahead and swing away. After the game, Riggleman defended the move, calling it a good bluff, but that he had always intended to keep Strasburg out there if Desmond came aboard, figuring the odds would favor keeping Strasburg on the mound in the sixth over getting a hit from Willy Harris. 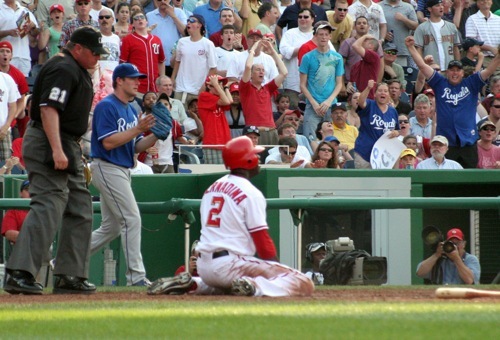 While I’ll agree that getting a hit from Harris in any situation was highly unlikely, it seemed to be throwing in the towel when the Nats were down, and that’s something I would’ve expected from Manny Acta, not Jim Riggleman. The sixth was a bigger snafu. Nyjer Morgan would lead off with a walk, and Roger Bernadina would attempt to bunt him over to second. Except that instead, he just managed to get Morgan picked off when his bunt went right to the third baseman. Zimmerman would get a hit, adding insult to injury, as that would’ve scored Morgan had Bernie’s bunt been a success. Adam Dunn would then scorch a single into right field and eventually into the glove of Jose Guillen. Guillen, as Nats fans may well remember, has a bit of a cannon out in right, and laid down a perfect frozen rope to Jason Kendall at home. Bernadina’s slide was far from textbook, as his leading foot drifted up, and Kendall applied an excellent tag, and that would be it for him. The play was close, and the replay, to me, seemed to indicate that he was safe, but neither Hammer (preparing to bat) nor Riggleman (on the steps) would come out to raise a fuss with home plate umpire Wendelstedt. Willingham would go down on a called strike to cut short the rally. Overall, yes, Bannister did have a good outing, but the Nationals’ mistakes handed this game to the Royals, not the other way around. It’s disappointing to see the offense unable to deliver Stephen Strasburg a single run, and though tonight he said it didn’t bother him, the way in which he said it spoke volumes. Bernadina was safe!! That would have gotten Stras off the L.
Oh well, another great outing by the Strikeout Kid. 41 strikeouts…and just 5 walks, all of them in one game? 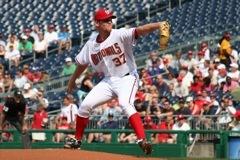 Strasburg has inhuman control.